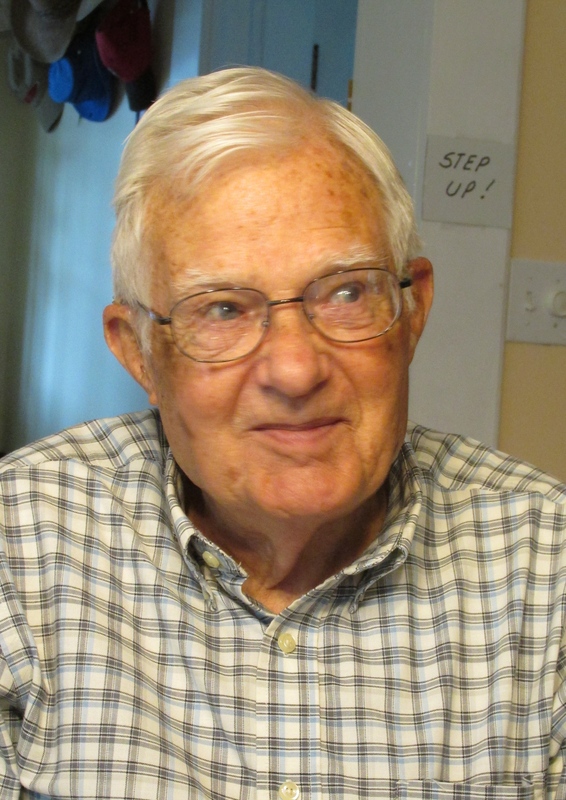 During his freshman year at the University of Ohio in 1943 Cliff Birdsall of Punta Gorda Fla. was drafted into the U.S. Army in the middle of World War II. A few months later he found himself fighting in Europe as a 57 millimeter gunner in the 106th Infantry Division, part of Gen. Omar Bradley’s 1st Army. “A few weeks after we arrived in Le Havre, France we replaced the 102nd Infantry Division at the front in Belgium. It was just before Christmas 1944.” the 90-year-old former soldier recalled 70 years later. At the time, Gen. Eisenhower bet Prime Minister Churchill the war would be over by Christmas. He was dead wrong. “We moved up to the front on Dec. 11, 1944 five days before the Germans attacked. We were green troops, as green as grass,” Birdsall said. “Our division had the responsibility for protecting 20 miles of front. Normally a division would cover a five to seven mile front line. “We were still in summer clothing. We didn’t have waterproof boots, we had leather boots. Summer clothing wasn’t very warm when it was snowing and because our boots weren’t waterproof we all got trench foot. “Then on Dec. 16 sometime between 5:30 and 6 a.m. all hell broke loose. The Germans opened up on us with an artillery barrage. We didn’t even know they were there,” the old soldier explained. The U.S. 106th Infantry Division was holding the center of the line during the initial phase of the Battle of the Bulge at the Ardennes Forest in Belgium. Birdsall and his untested buddies faced the seasoned 5th Panzer Army, some of Hitler’s best troops. A bit more than a month later, American forces regained the offensive when the weather broke and the U.S. Army Air Corps again ruled the sky knocking out scores of German tanks and guns. By then 610,000 U.S. had upwards of 89,000 casualties. 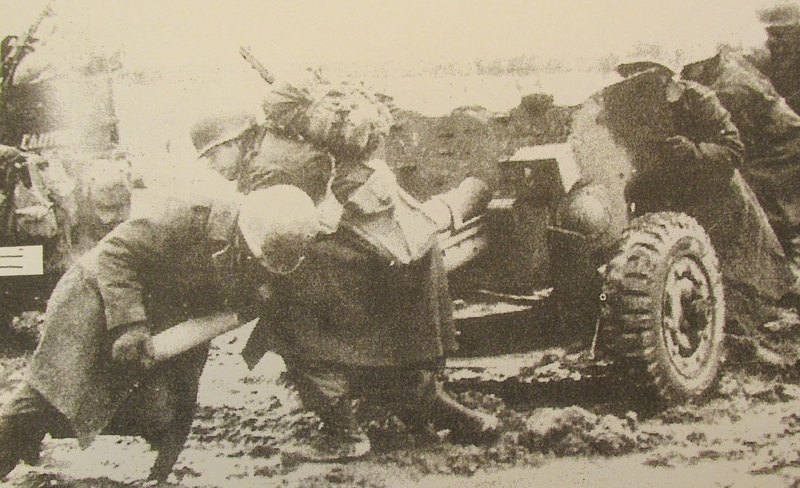 The three German armies that launched the ill-fated attack in the Ardennes with 250,000 men suffered 60,000 to 80,000 killed and wounded. The Battle of the Bulge, as it became known, was the largest and most costly engagement on the Western Front during World War II. For Pfc. Birdsall and the 106th Division their troubles were just beginning. Between 7,000 and 9,000 American soldiers surrendered to the Germans during the early stages of the battle. It was the worst loss of U.S. troops in Europe during the Second World War. “After the initial German attack we spent a couple of days moving from here to there and digging in every time we moved,” the 90-year-old Birdsall said. “Then on Dec. 19, 1944 we got orders to destroy our weapons. I had a .45 pistol I took apart and buried somewhere. We pulled the block out of our 57 millimeter gun and buried that, too. Then I surrendered to the Germans. “The first night of our captivity we were outside in a fenced in area guarded by Germans. It started to snow. We were cold. “The next day we were loaded onto little World War I, 40-8 boxcars. Sixty of us–officers and enlisted men–were packed together standing into one little car. We couldn’t sit down for lack of space. “The officer had us count off. “Who was the American lieutenant colonel who ordered the POWs to sit and stand?” Birdsall was asked. “That same day … we were in a railroad yard somewhere in Germany when British bombers flew over and bombed the yard that evening. We were still packed in the locked boxcars during the bombing raid. “Why the boxcar I was in wasn’t destroyed I’ll never know. I guess God was watching over me,” he said. “On Christmas Day the Germans assembled what was left of the boxcars full of POWs. They hooked us up to a locomotive and took us further into Germany. “The boxcars had no windows. They also had no sanitation facilities and we had had no food. “When I was captured by the Germans I was carrying a small address book. They didn’t take it from me. I used it as a diary and wrote in it every day during my captivity. That’s how I know exactly what the date was when things happened to me all these years later. 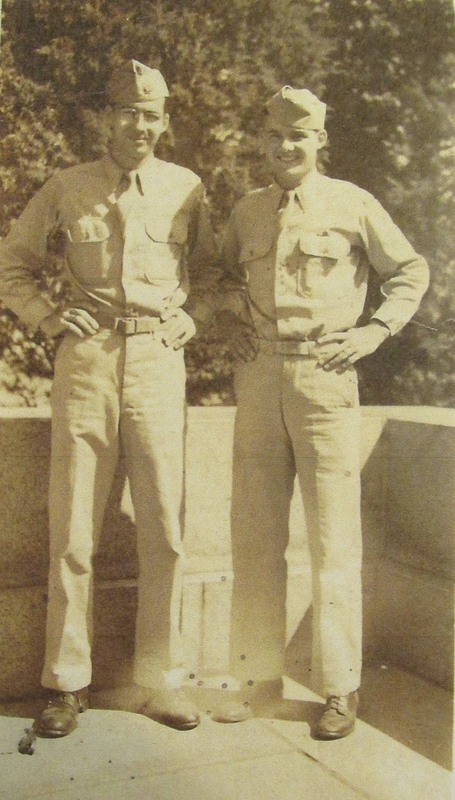 “We ended up in a large POW Camp in Muhlenberg, Germany. There we were deloused and I was given winter clothes from dead American soldiers. Some time later in January 1945 30 of us were put in a boxcar and sent to a brick factory,” he said. “We were given picks and shovels and all 30 of us worked in clay pits digging clay for the nearby brick factory. We put the clay into small railroad carts that were pulled by a locomotive to the brick factory. “When we weren’t digging we lived in a wooden barrack surrounded by barbed wire and guarded by men who were too old for the German army. They knew how to handle rifles and they spoke to us in loud, rough voices in a language we didn’t understand, but we knew what they meant. “They never abused us. When we got out of line they would shoot at our feet with their rifles. That was as close to abuse as they came. “Our food consisted of awful tea in the morning. At noon they gave us potato or turnip soup. For dinner we got brown bread, mostly made out of sawdust. One loaf of sawdust bread fed five of us. “The saving factor, much to our surprise, we got Red Cross packages four or five times during the three months we were there. We swapped the Germans our cigarettes and chocolate from the packages for potatoes. “Sometimes while working in the clay pits we could see our B-17 bombers flying over. One time we made the mistake of singing as the bombers flew over on their way to a raid over Germany. We knew the Germans were catching hell from our bombers and we loved it. “Our guards didn’t. They shot near our feet. We stopped singing. “Toward the end of the war the guards didn’t know what to do with us. They knew they didn’t want to have to surrender to the Russians who were closing in on the camp. So they marched us out of the POW camp. We marched all over Germany for the next month or so,” Birdsall said. “As we marched along we were joined by many other Allied POWs. We walked behind a bunch of British Indian POW troops who took care of us. They really saved our lives. “They had been in a big German POW camp and were in pretty good shape. Each time we stopped on the road for a break these Indian POWs would get a fire going, make tea and bring some back to us. When we got going again they made sure we were all up and walking once more. “On the night of April 25, 1945 we ran into five GIs from the American 104th Division. They told us to hang in there and the next morning their division would liberate us. They were right, on April 26 the 104th marched in and our German guards disappeared. Finally they reduced their food intake and the former POWs improved. But not enough to be sent home quickly. “We spent weeks waiting for a ship back to the U.S. at Le Havre, France. We figured out we weren’t going to be sent home until they got us fattened up. I lost 33 pounds while a POW. When I was captured I weighed 175 pounds and when released weighed 142. “We took a liberty shop home that blew a boiler in the middle of the Atlantic. On June 18, the day before my 21st birthday, we sailed into Norfolk, Va.
“It wasn’t like we came into New York in a convoy of ships. We were one little liberty ship coming into port in Norfolk,” he recalled. “It was no big deal. “We were given three minutes to call home when we reached port. There was a line a block long waiting to call. I got my dad and told him I was on my way. I went home to Brecksville, Ohio, 14 miles outside Cleveland. Cpl. Cliff Birdsall’s war was over. He took the G.I. Bill and resumed his college education. Birdsall graduated from Ohio State with a degree in Civil Engineering. He worked 40 years as an engineer then retired to Punta Gorda in 1990 with his first wife, Ruth. They had three children: Kerrie, Clark and Clifford. He married Margarete after Ruth’s death. This story was first published in the Charlotte Sun newspaper, Port Charlotte, Fla. on Monday, January 19, 2015 and is republished with permission. Click here to view Birdsall’s collection in the Library of Congress Veterans History Project. Click here to view Birdsall’s interview with Wink News, Fort Myers, Fla.
A remarkable tribute and a man well worth honors for his service. He will be remembered! The amazing thing about these tales of survival is that they happened at all. So many didn’t survive similar circumstances. I’m glad I get to read these because it means someone — you, family members, people who lived or knew of the events — care enough to put down the details while they still live in the memories of a fast-declining group of survivors. I’ve told you this before, but you truly do honor to the memory of your father with this blog! May GOD BLESS ALL our EX and Active Military members..
Reblogged this on War Tales. My dad was a Medic in the 44th Infantry Division – they went thru France, Austria & Germany. he was in the Army from Sept 1940- December 1945 ! He never talked much about it So I don’t know what he encountered – but I’m sure it was pretty horrendous.